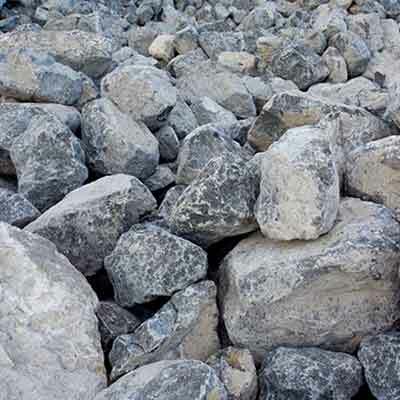 Riprap, as rip rap, rip-rap, shot rock, rock armour or rubble, is large, heavy rock that is strategically place along shorelines, streambeds, bridge abutments, pilings and similar structures to prevent natural weatherization or shoreline erosion. It is made from a variety of rock types, most commonly granite or limestone, and occasionally concrete rubble from building and paving demolition. Erosion Control – It can be used to fortify any waterway or water containment where there is potential for water erosion.​ This includes lakes, rivers, oceans and ponds that experience a natural flux of water, which will cause the shoreline to erode over time. Railroad Ballasts – Depending on the size, rip rap rock might also be used to divert water away from and provide enhanced stability for railroads. Driveways – Similar to other types of construction aggregate, this material can be used to construct roads in rural areas. It’s an easy-to-use method for decreasing water velocity and protecting slopes from erosion. It is simple to install and maintain. It provides some water quality benefits by increasing roughness and decreasing the velocity of the flow, inducing settling.